Eczema is a medical condition of the skin, in babies, can usually be found in front of elbows, behind knees and on the neck, where creases of the skin can trap sweat and moisture. This results in itching, redness and a drying of the skin, with more scratching this can result in broken skin, bleeding and infection. There are a number of factors, causes of eczema in your child. There is currently no baby eczema cure cream, however HydraNure, organic baby eczema treatment cream turns infant eczema into beautifully soft, moisturised skin fast, in some cases within 24 hours. Can eczema in babies be cured? There is currently no baby eczema cure cream, however a good skincare management system will reduce the chances of those red, itchy patches reoccurring, once they are under control. There are a number of other ways to help manage eczema but moisturising often using natural baby eczema cure products without skin irritants like perfumes, scents, dyes, parabens, phthalates and phenoxyethanol and mineral oil is a huge step in the right direction. 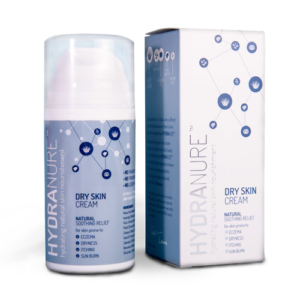 Apply HydraNure, eczema cure creams up to four times a day, in the morning, lunchtime, immediately after bathing, before bed and any other time dryness occurs. HydraNure is also an organic baby eczema treatment cream using five plant based ingredients known for their skin healing properties. Please find below some tips in successful skincare management that will help keep your little ones skin beautifully soft. Wearing loose fitting cotton clothing helps keep skin temperature manageable and always wash clothes in non bio detergent without fabric conditioner. As winter approaches keep radiators to a warm temperature as heat dries the moisture in the air which in turn causes itchy skin. Food and dairy intolerances are on the rise. Try using the subtraction method where you take something away for up to a week, if no improvement then reintroduce and take something else away. Examples would be strawberries, cucumber, tomatoes, cheese, cow’s milk, the list is endless. Cigarette smoke, air fresheners, plug in air fresheners, perfumes, aftershaves and deodorants can all be irritants too. Fast acting, proven, natural and organic cream designed for dry, itchy and sensitive skin conditions including baby eczema, psoriasis and rosacea. With 5 plant-derived ingredients, vitamin E and a natural Eco-certified preservative made from olive oil. In a survey of 141 children with existing skin conditions from dry, itchy skin to eczema, their parents said 96% had softer skin after using.